Completing a First Draft!!!! Why we celebrate! I know this is a bit premature considering all the posts on writing first draft I have been putting up in the last couple of months, but, after five weeks, I just completed a FIRST DRAFT of a PROJECT yesterday! Not a final screenplay, that’s certain – knowing how this process works with previous projects on my end at least, it’s probably going to go through at least a dozen or more drafts before I can say it’s even close to a spec script I would be willing any other human beings to see – but a FIRST DRAFT. After all that dreaming and prep: outlines, beat-sheets, biographies, I wouldn’t be the first person to say it’s the nicest feeling in the world to complete something! A beginning to an end and so on and so forth! 3) I have CHARACTERS – people, situations and other likeable nonsense and gags that is probably not going to make it past first draft, but who cares? No one can argue that it’s all on paper! 4) It doesn’t matter if I have already done this once, ten times or a hundred! It still rocks! 5) It doesn’t matter that I literally almost never looked back while I wrote it, because when I do in a few weeks, I will know despite my elation, it’s crappy, but not completely and I can fix it! Speaking of which, the best part of all my weeks of PREP actually CAME to something, so writing the first draft, which in the past (due to thankless procrastination) would take me months now took me just about four weeks, so for anyone out there who has had the same struggles to complete something, KNOW IT CAN BE DONE. To conclude, I don’t have a complete screenplay of this particular project….yet! 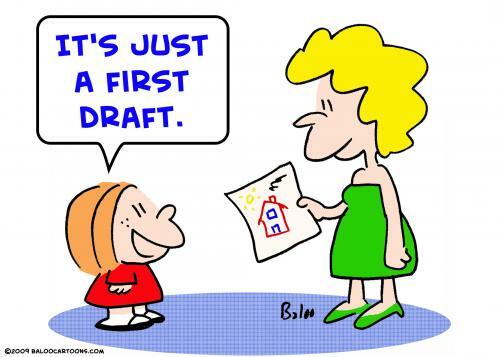 But I DO HAVE A FIRST DRAFT. P.S. For anyone else who wants to celebrate, here’s something to tantalize your taste buds! This entry was posted in First Draft, Screenwriting, Writing, Writing techniques and tagged completing a first draft, first draft, screenwriting, writing process. Bookmark the permalink. Way to go! Getting the first draft done is the hardest part. Now the fun really begins. Good luck! Thanks Paul!! Appreciate the encouragement, haha! Going to need it for another first draft before I retackle this one!